Here at pet box subs, we love our pets. But then again shouldn’t every true pet owner? We are busy building our little site to give you top-level user reviews of each of the main products that are designed to make our pet’s lives even easier. No more dashing to the shops for treats or presents for your pets, they will be delivered to your door each month with a pet subscription box. Check out our Barkbox Page for information on their latest products. Read more about the different dog box subscriptions that we have reviewed here. Read more about the different cat boxes and cat box subscriptions that we have reviewed. What is a pet box subscription? The latest trend in the shopping world involves subscribing to receive a box of goodies every month by mail, consisting in things like books, food, wines, beauty products or even clothes and underwear, all delivered right to your door. And considering two out of five American households have at least one dog (usually two or more) and dog owners spending more than 100$ a month on average for their canine friends, it was only a matter of time before dog box subscriptions became a thing. 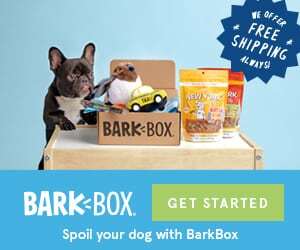 Many entrepreneurs have taken the subscription box idea for dogs as a very interesting and potentially lucrative business opportunity and in 2011, BarkBox was born with a clear idea of offering a monthly subscription service that includes various treats to dogs. The bark box idea proved to be a winner from the start, with the dog loving customers loving the accessibility and the fact that you can tailor your box depending on your dog’s size. The number of subscribers reached 50,000 by 2013 and nowadays, more than 200 000 happy dogs await their treats every month. They’ve also expanded the business to other dog-related products like a dog themed website called Bark Post, the photo sharing app BarkCam and the so called “Tinder for dogs”, Bark Buddy. To learn more about Barkbox click here. So instead of wandering around pet shops not knowing what new toys and snacks to get for your pup, it’s best to leave this task to professionals who love dogs just as much as you do and who dedicate their lives so that everyone’s good boy or girl get the happiness and health that they deserve.